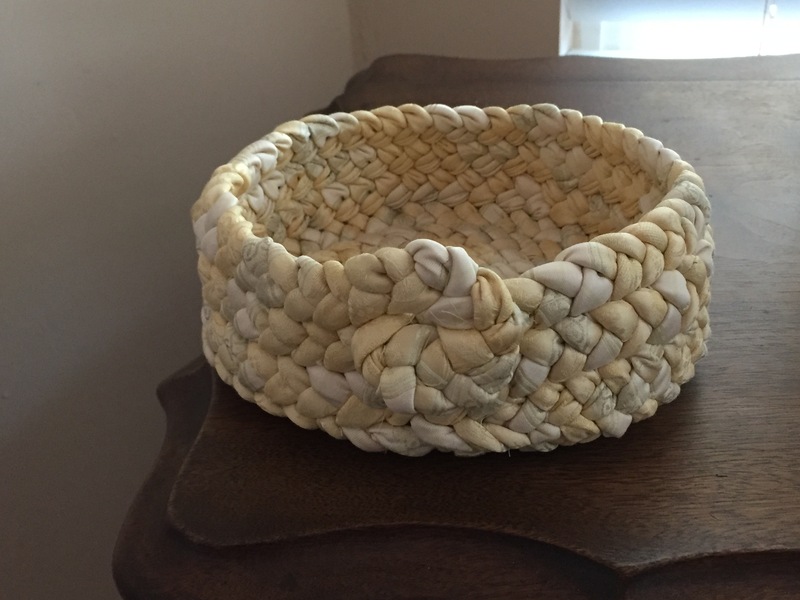 Many of you know I love making baskets….and I have evolved from the continuous method of a spiral which of course ends up with ‘an end’ to hide, flair, etc. to all butted to what I call a hybrid where the base is spiral, tapered then all butted sides. Butted sides provide opportunity to change fabric by row without joins, have separate rings, and a flat top row without an end to hide. With a continuous spiral there is a bump where the lacing begins to go up the sides. Depending on the fabric it may be minimal or really show. And you have to choose between having your ‘better braided side’ be on the inside of your basket OR on the outside of the sides. You can’t have both….that is why I like the hybrid so much. 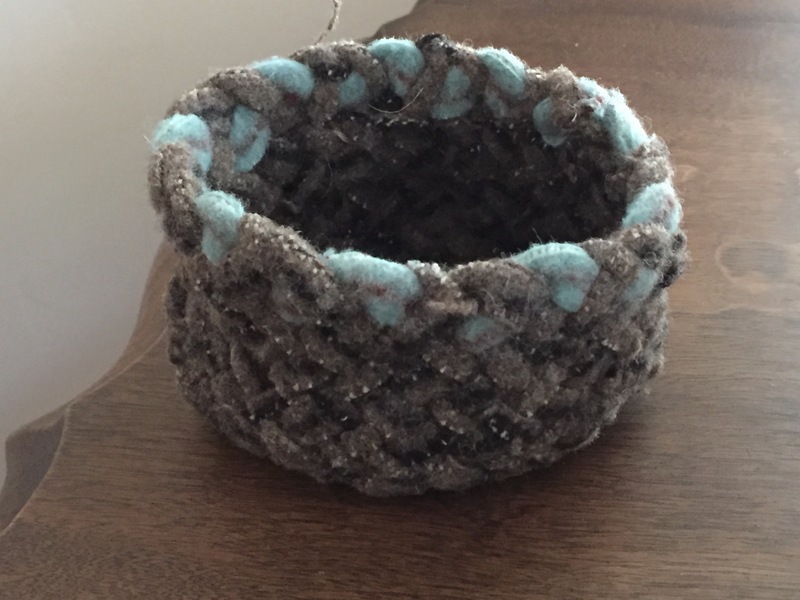 You can have your better side on the basket inside base AND on the outside since the sides are butted. 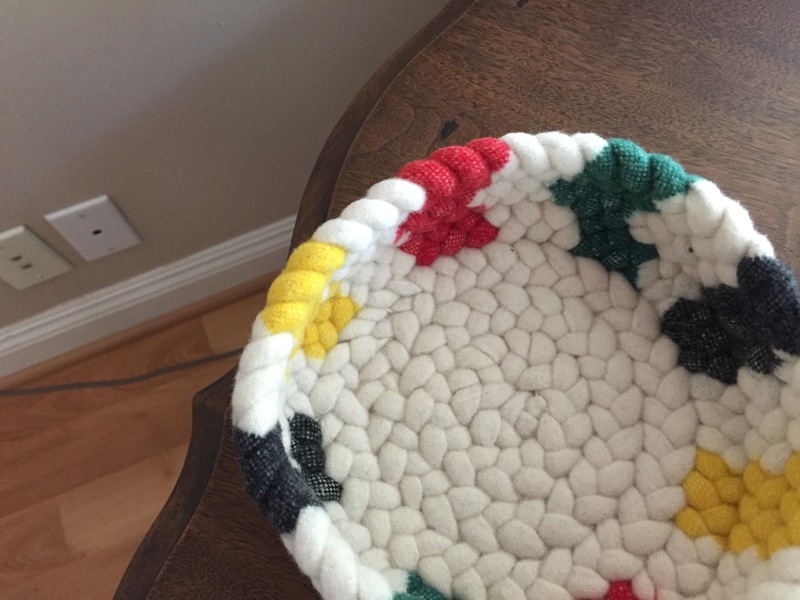 a small wool and velvet oval basket with a fringe. I use it for my hooks and hooking scissors. 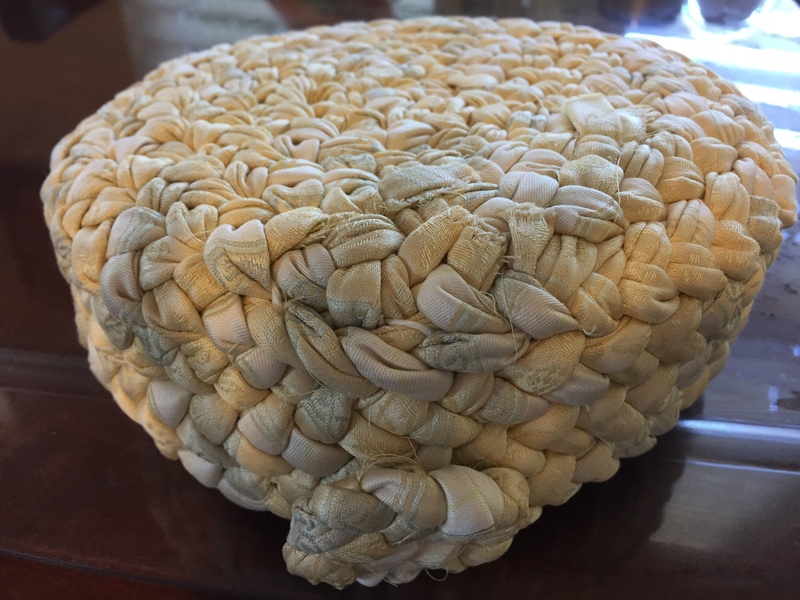 With an all butted basket, there are many possibilities. No taper, no long end to hide, but time consuming! With the hybrid there is some bumping at the point where the taper occurs and this can affect the evenness of the sides. With soft wool and velvet this is less apparent; with cotton more apparent because it is stiff. 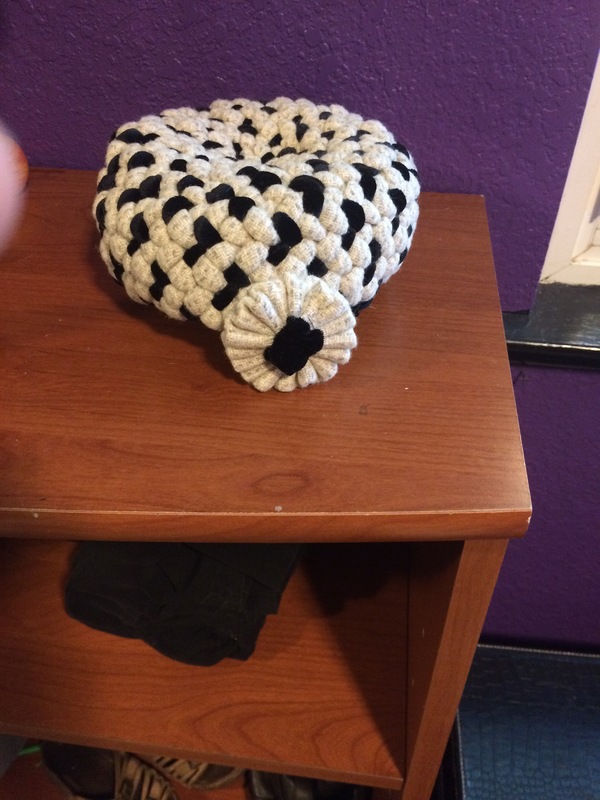 Hybrid wooly worm basket. Continuous base and butted sides. 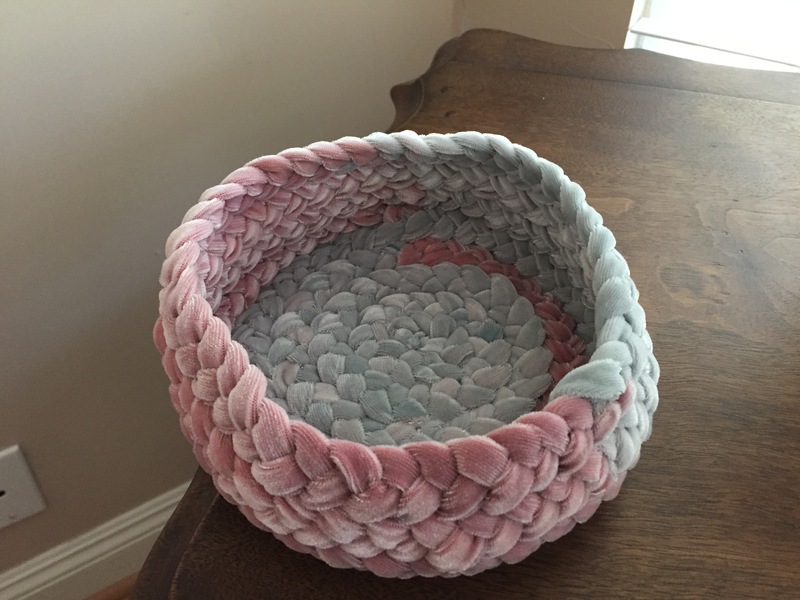 As I continue my new fascination with braiding cotton (“oh no, you never want to braid with cotton”), hybrid baskets became less enjoyable because butting the sides was tough. Cotton is just so much less flexible, forgiving and stretchable than wool. And braided cotton has tweaks, especially if you use more than one thickness. 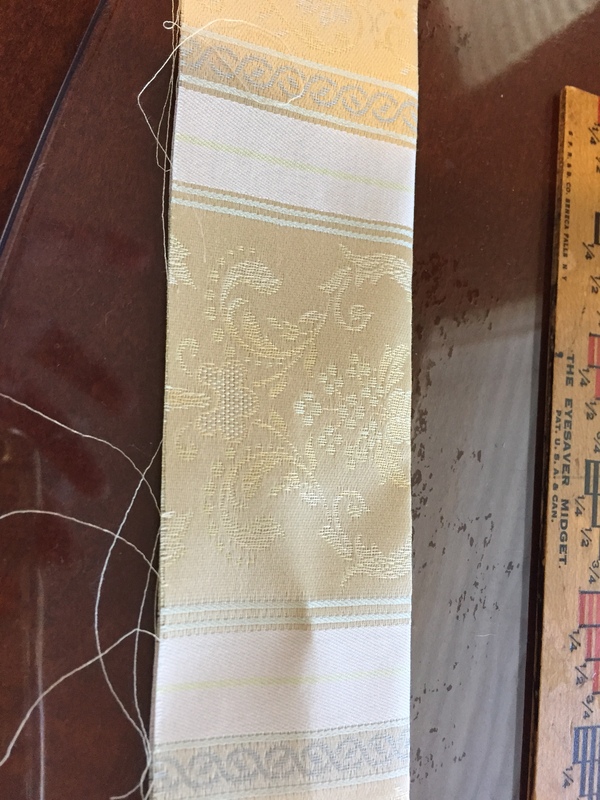 So I began to think…..how about a continuous base, taper as with a hybrid, but instead of butting the sides, begin the sides with a taper and create a continuous side so finish with an end to hide. Kind of best of both worlds? 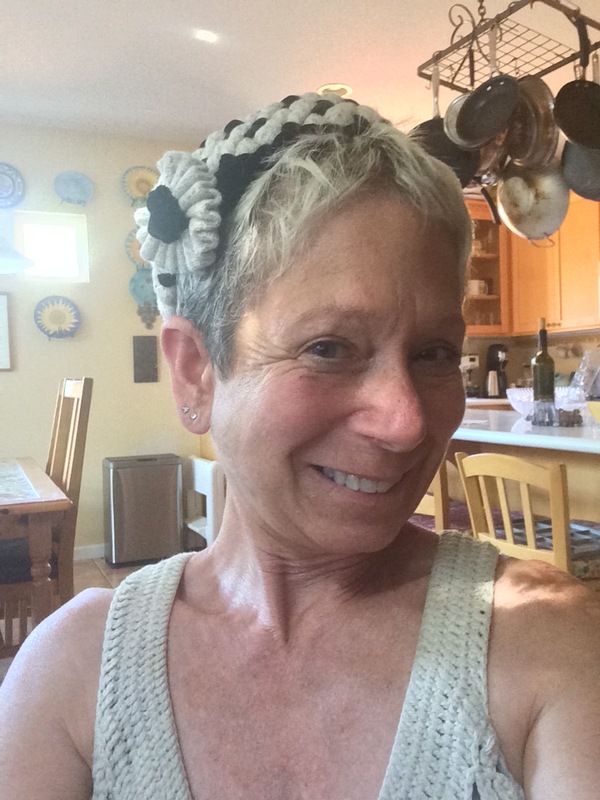 I checked with my muse, Christine…..and began. n half to braid 1.75″ strips to give the cotton more body. I tapered the base then tapered 3 strips, folded in the raw edges, pinned them and began braiding. 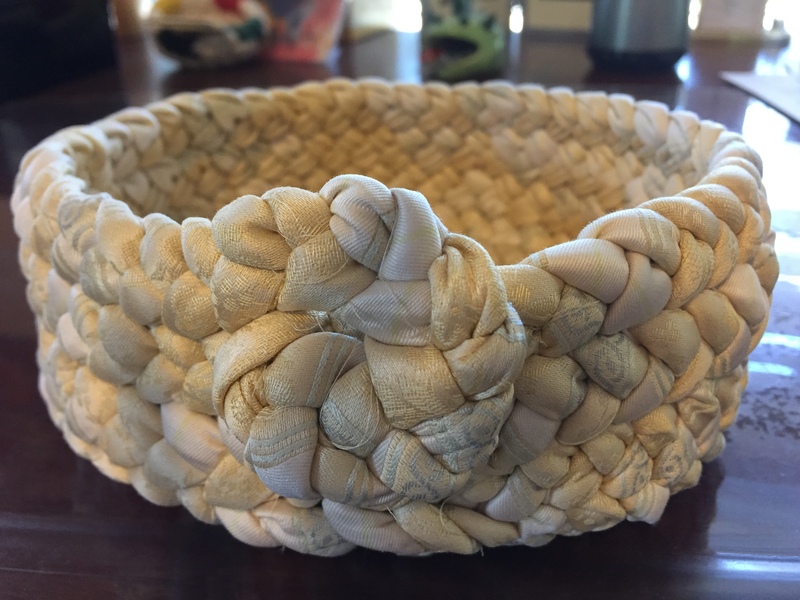 When I braided a few inches I pulled the tapers through to the inside of the basket at the point of the base taper and secured them then started lacing. New glossy cotton basket tapered base and tapered sides ended with a reverse double corners to create a rosette. Next time I will make the side tapers longer to have more room to work with at the end when I tacked down the tapers to the inside. Because the cotton was so stiff I was able to push down the area that had the base and side tapers so it is pretty even. For working with cotton, I am pleased. I like the rosette and no butting! 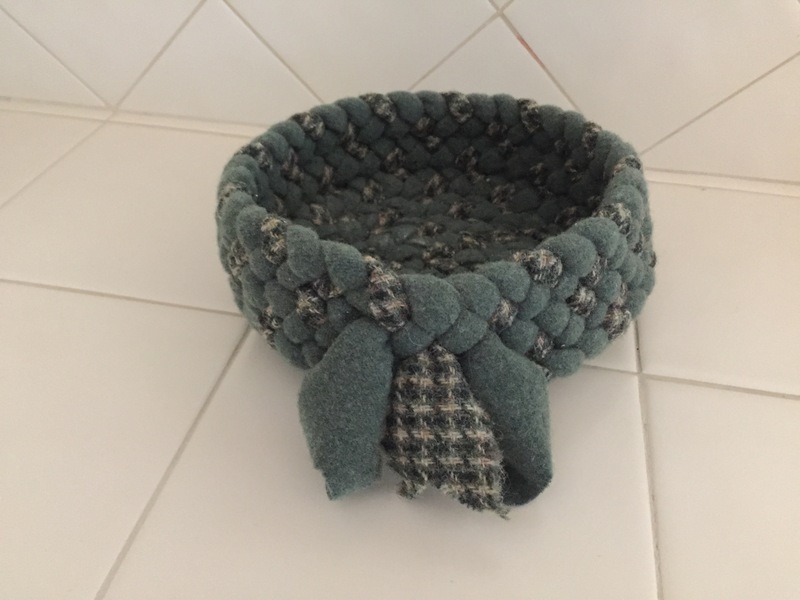 One of my braiding students is a seamstress and she has given me cotton scraps so I am onto the next Taper In, Taper Out Basket: The Tobias Taper! 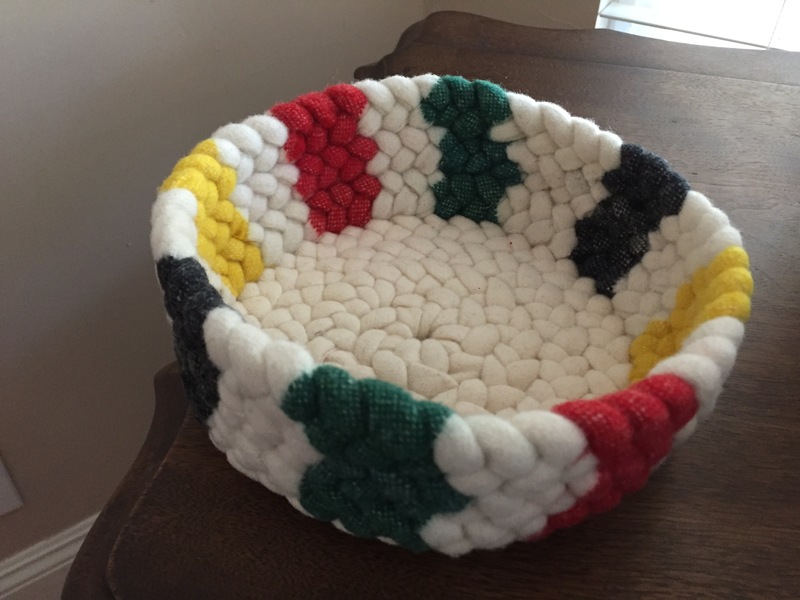 PS: For years, non-braiders have joked that my baskets look like hats and my kids have even paraded around with them on their heads; I have too come to think of it when we had a braiding fashion show at the Methuen Braid In. 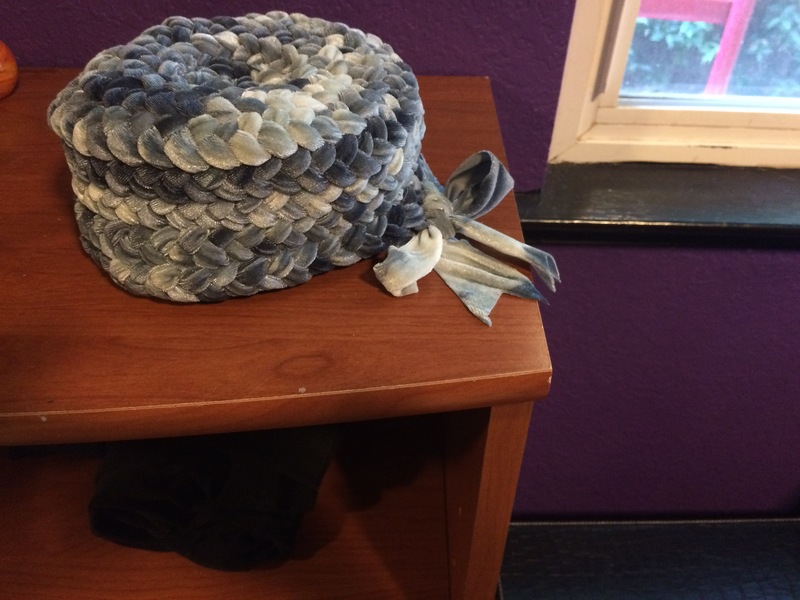 I have a friend in town who loves hats and I have given her several of my old continuous baskets and she wears them. She is as short as I am tall and her hair is as short as mine is long. She looks great in hats. She is going to France this week and wanted a black hat. Here are the two I made her. The mottled velvet one is more grey/blue than black despite using alot of black dye, it . It is my stretch hand dyed velvet so it hugs her head; she looks like a flapper!